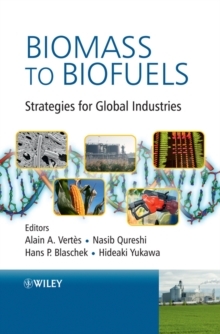 Focusing on the key challenges that still impede the realization of the billion-ton renewable fuels vision, this book integrates technological development and business development rationales to highlight the key technological.developments that are necessary to industrialize biofuels on a global scale. Technological issues addressed in this work include fermentation and downstream processing technologies, as compared to current industrial practice and process economics. Business issues that provide the lens through which the technological review is performed span the entire biofuel value chain, from financial mechanisms to fund biotechnology start-ups in the biofuel arena up to large green field manufacturing projects, to raw material farming, collection and transport to the bioconversion plant, manufacturing, product recovery, storage, and transport to the point of sale. Emphasis has been placed throughout the book on providing a global view that takes into account the intrinsic characteristics of various biofuels markets from Brazil, the EU, the US, or Japan, to emerging economies as agricultural development and biofuel development appear undissociably linked.